Billing Preferences offer you the flexibility to control your billing needs for all your 8x8 services. The options vary based on your subscription type. You have the option to select Consolidated Bill under Billing Preferences. Once you select consolidated billing, you cannot go back to unconsolidated billing. You receive a warning message that this change cannot be undone. Note: SMB customers do not see Billing Preferences. Under consolidated billing, you can choose to receive a single bill for all of your services, or select multiple bills (one for each cost center) to break down the cost and service details by cost center. Cost Center is a feature for enterprise customers to customize their billing needs. For example, if your company PBX has two branches, such as San Jose and San Francisco, you may choose to have separate billing for each branch. Creating a cost center for each branch enables you to manage the separate billing needs. For details, refer to Cost Centers. Click Billing in the top navigation bar. Under the Billing menu, click Billing Preferences. Enable Single Bill (Default) to see one bill for the cost center. Enable Multiple Bills by Cost Center to see multiple bills for each cost center. If you have two branches, such as San Jose and San Francisco, you see two monthly bill statements for each billing cycle. To create cost centers from PBX branches automatically, select the Auto Create Cost Centers from Branches check box. Note: Payment types can include invoice, ACH (checking), and credit card. If you want to keep invoicing, make sure retain your payment type selection to invoice. If you change it to ACH or credit card, you cannot move back to invoices. Click Cost Centers in the top navigation bar. You now see a list of cost centers for your existing branches. Note: If you created cost centers manually for your branches and later decide to link the cost centers to branches, you must delete the existing cost centers and enable the option to automatically create cost centers from branches. Deleting cost centers does not affect your accounts. Add-on services added to extensions associated with a branch are automatically reflected in the cost center. New services added to branches are automatically reflected in the cost center. You can create cost centers manually, or automatically if you have branches. To access cost centers, go to Billing > Cost Centers. The ability to create a cost center is available only to Enterprise customers who have set up consolidated billing. If you have unconsolidated billing and would like to manage billing through cost centers, you must change your billing preferences from Unconsolidated to Consolidated in Billing > Statements. In the manual setup, define a cost center based on accounts but not mapped to branches. In this case, changes done to branches are not reflected in cost centers. Under the Billing menu, click Cost Centers. Enter a Cost Center Name, and click Add Accounts. A list of available accounts appears. Select the ones you wish to add to your cost center. You must add at least one account. You can add or delete accounts to an existing cost center at any time. For details, refer to Manage Cost Center Accounts. The cost center is created and added to the list. 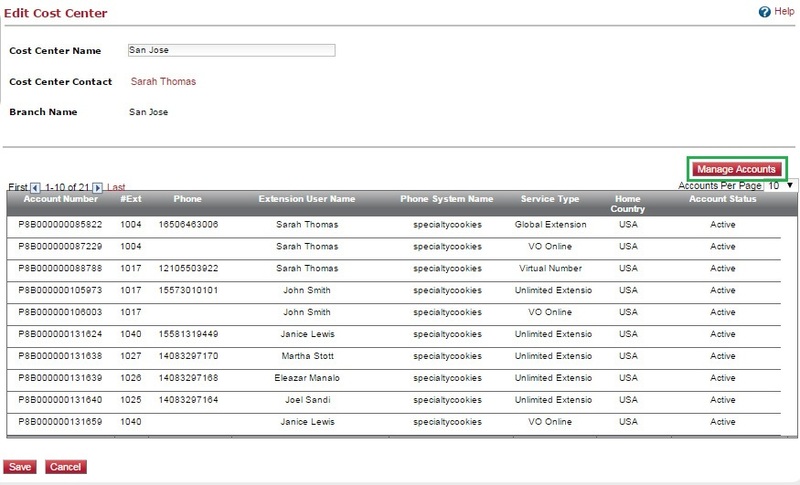 Click Edit to rename or manage the cost center accounts, or click Delete if you wish to remove the cost center. Note: You do not have the privileges to delete cost centers created automatically from branches. If your company's PBX is segmented into branches and you wish to have cost centers for each branch, you can choose to create the cost centers automatically and set up the billing preferences to generate cost centers from branches automatically. The cost centers are mapped to branches, and are in sync with changes made to branches. All changes to the branch are automatically reflected in the cost center. If you wish to separate cost centers from branches, you can go back to Billing Preferences. Select the Decouple Cost Centers from Branches check box. A message warns you that the change cannot be undone. When you create a cost center, you must add accounts to it. Each account is based on service types, such as Unlimited Extension, Service Extension (Ring Group, Call Queue, and Auto Attendant), the Virtual Office desktop app, or Virtual Extension. 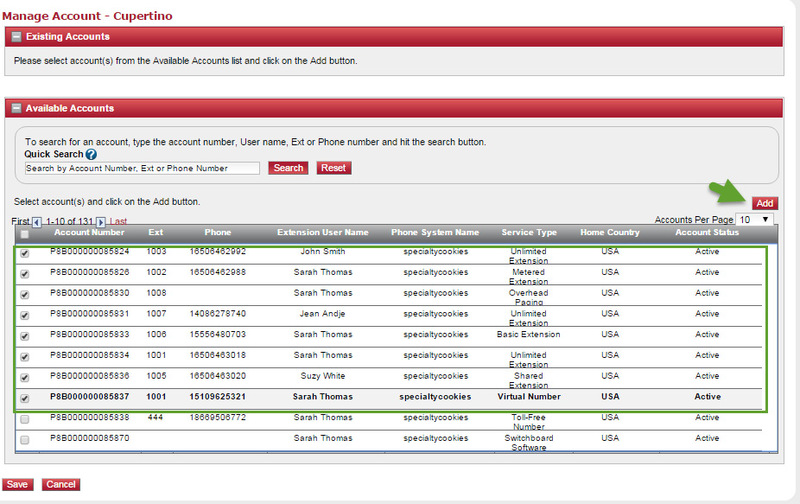 When you add new services to your PBX, the new accounts show up under Corporate Cost Center in your statement. To assign these accounts to the desired cost center, edit the cost center, and go to Manage Accounts. In the Billing menu, click Cost Centers. Click Edit next to the cost center in the list. A list of accounts, extension numbers, and extension users appears. Select a check box by an account under Existing Accounts. The Choose to Assign / Reassign option box appears under Existing Accounts. Select an option from the drop-down list. You can choose to un-assign an account from its current branch and assign it to another. Select a check box by an account under Available Accounts. The selected account is added to the existing accounts. All changes to branches are reflected in cost centers bound to the branch. All line items (service type accounts such as Virtual Office Analytics and Barge-Monitor-Whisper) that can be added to a cost center by managing accounts do not update the associated branch.